← Is it a rabbit, is it a broomstick driver, is it a bird? 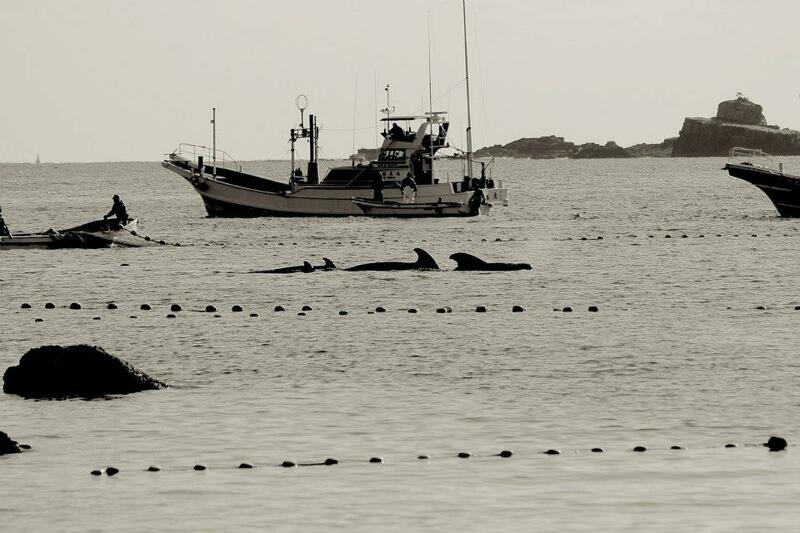 This is a massive weekend for the dolphins and whales of Taiji Cove. Lots of people will use their voices on behalf of the cetaceans to protest against the barbaric drive hunts, capture for human entertainment and the inhumane slaughter for meat. There is likely to be press coverage and a lot of commentary on the day. I am going to the protest outside the Japanese Embassy in London on Friday so I will tell you how it goes. The Embassy is closed on Saturdays (the hunters do not go out either on Saturdays in Taiji although they did last weekend as their hunting success rate has decreased) hence the event taking place on the Friday. However, if you are in the vicinty, people will be present to hand out leaflets and talk to you on the Saturday. Organisers are requesting that you let them know if you are planning to attend as it will help them to get an idea of the numbers. But even if it is a last minute decision, I would turn up anyway as everyone would be so welcome. 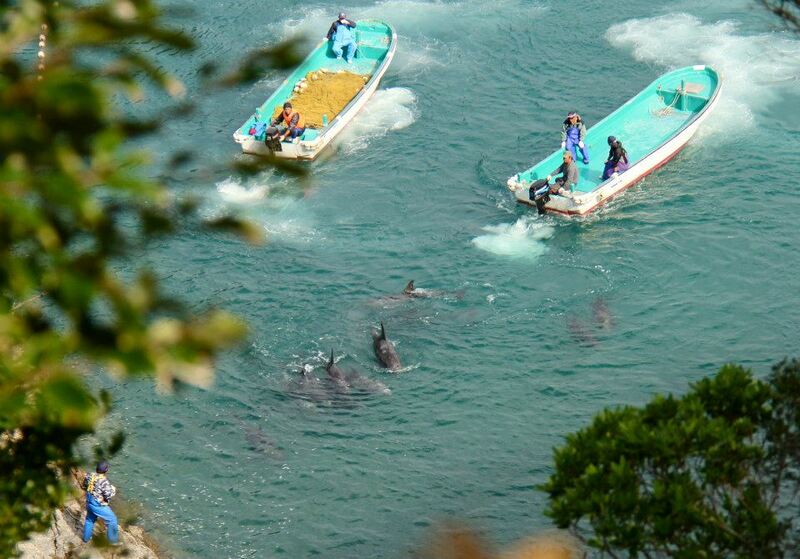 Above is a family of pilot whales that were driven into the Cove at high speed yesterday. 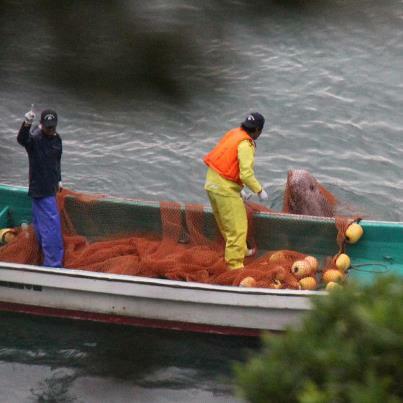 You can see that they have been netted in and were brutally slaughtered not long after. Tarpaulin is then placed over the area as the hunters do not want the world to know what they are doing. The photo is courtesy of Sea Shepherd Cove Guardians who are always there to witness so that we can be a voice for the voiceless innocents. One brave whale saw his family being butchered and tried to escape. He fought his way out of the tarpaulin twice but he could not get away due to the nets. We must fight for them and we must win. Early this morning (22/11/12) 9-10 Rissos were driven into the Cove and slaughtered including this enquiring little faced one. Photo courtesy of Sea Shepherd Cove Guardians. They cannot intervene by law. This entry was posted in Animal Work, Dolphin, Taiji Cove and Related Information, Taiji Terror Tales and tagged animal welfare, Death, dolphin, japan, Mother Nature, Taiji Cove and Related Information, whales. Bookmark the permalink. A protest outside the Japanese Embassy against the Taiji dolphin slaughter! Meeting place: Outside Japanese Embassy over the road.